Citi Elite in fizzy blue colour has large tyres and high weight capacity, the Citi Elite Single provides luxury and comfort over any terrain. 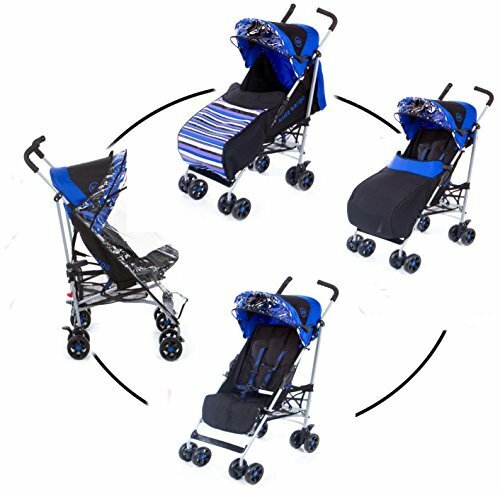 This stroller lets you go off-road in style, while still offering Baby Jogger’s patented quick-fold technology. The Citi Elite is not intended for jogging. Lift one strap and the Citi Elite folds itself: simply and compactly. It really is as easy as it sounds. And the auto-lock will lock the stroller for transportation or storage. The Citi Elite offers an array of storage, including a built-in parent console that keeps your most used items at your fingertips. This seat was built for comfort. It reclines to a near flat position with vents and a retractable weather cover to make sure that your child is comfy and safe while you stroll. The raised kicker is ideal for accommodating small children and it provides easy access to the under seat basket. People love our UV 50+ sun canopy because it really throws a lot of shade on a sunny day. It has a peek-a-boo window with magnetic closure so you can quietly check on your little one and it can be adjusted to multiple positions as you open or close it. And two side vents provide ample air circulation to keep your child comfortable when its hot out. You can set your 12 inch front wheel to swivel for your daily obstacle course or lock for long distance strolling. The All-Terrain tyres let you make your own rules, giving you full control on where and how you go. The Citi Elite also offers a front-wheel suspension that provides a smooth ride for your little passenger. Handlebar height is 104cm. Hand-operated parking brake keeps all the controls within reach. Includes rain cover and reversible footmuff.